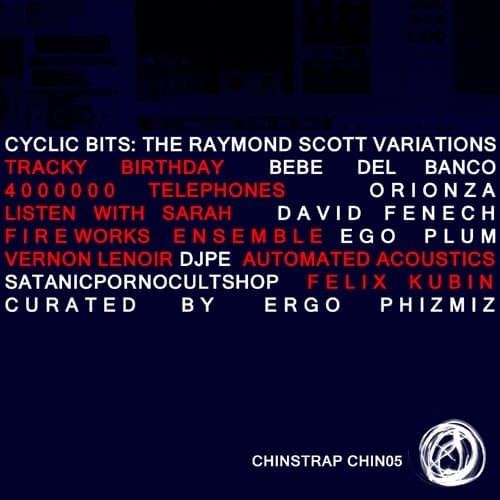 cyclic bits is the first remix album of the music of remarkable composer and inventor raymond scott. inlcuding remixes by felix kubin, the the, satanicpornocultshop, vernon lenoir, and many more. compiled by ergo phizmiz. this album is a series of reinventions of the work of a true musical maverick, remixed by a host of today’s most inventive musical mavericks. the diversity of the release reflects the profound influence scott’s work has had on composers working across the board of styles and approaches. I guess Raymond Scott (1908-1994), a legendary visionaire, seminal composer/electronic music pioneer, and instrument builder would have been proud of this 16-track issue because the artists represented there have poignantly revealed the attitude and nature of the legend. Stylistically the whole folds into a divergent array of styles – from off-beat, whimsical jazz-y grooves and lopsided swing to demented metal outbursts and exotica pop tinged explorations. And of course, there are up a lot of experimental electronica tracks mimicking the acid and beeping sounds of his synthesizers or the gliding motives of his compositions which later would have adapted to famous cartoons. There participate such artists as Tracky Birthday, Bebe Del Banco, 4,000,000 Telephones, Orionza, Listen With Sarah, David Fenech, Fireworks Ensemble, Ego Plum, Vernon Lenoir, DJPE, Satanicpornocultshop, Automated Acoustics, and Felix Kubin. The miscellany is issued on wondrous Chinstrap Music.